Gastly is a Ghost/Poison type Pokémon introduced in Generation 1. It is known as the Gas Pokémon . The effectiveness of each type on Gastly. In Generation 1, Gastly has a base Special stat of 100. In Generations 1-4, Gastly has a base experience yield of 95. When exposed to a strong wind, a GASTLY’s gaseous body quickly dwindles away. They cluster under the eaves of houses to escape the ravages of wind. 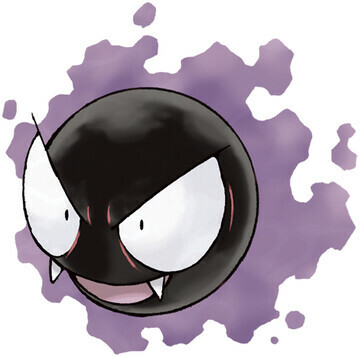 Although Gastly is barely visible, when it’s near, a faint sweet smell lingers. It’s said that gas emanating from a graveyard was possessed by the grievances of the deceased and thus became a Pokémon. Poisonous gas comprises 95% of its body. It’s said that the remaining 5% is made up of the souls of those who died from the gas. Gastly learns the following moves in Pokémon Let's Go Pikachu & Let's Go Eevee at the levels specified. Gastly learns the following moves in Pokémon Ultra Sun & Ultra Moon at the levels specified. Gastly learns the following moves via breeding in Pokémon Ultra Sun & Ultra Moon. Details and compatible parents can be found on the Gastly egg moves page. Gastly can only learn these moves in previous generations. It must be taught the moves in the appropriate game and then transferred to Pokémon Ultra Sun & Ultra Moon. Could this be a glitch? Pokèmon Quest, how to get Gastly? Where did all the Gastlys go? Will this kind of battle ever end?